Did “Love” Inspire me to shop Prabal Gurung for Target? “Inspired by Love” Prabal Gurung for Target line truly didn’t inspire me when I went to shop today. Well if you are familiar with the Designer collaborations that Target has had in the past they can be a Hit or Miss. Like Target + Neiman Marcus Holiday Collection which I believe was a major flop or the Missoni for Target Launch in 2008 that left zero product on the shelves for the REAL consumer as people were buying up carts full to immediately sell on eBay for 3 times the price,leaving a sour taste in most Peoples mouth. I blogged about the Prabal Gurung for Target last week after perusing the online Lookbook. I did see a few items that I would love to have added to my wardrobe like the Pointy toe flats Nolita print or the Flat Sandal but it was not available in stores or in my size online. I had also added to my list the Sleeveless Blouse in First Date Print which I did find in the store (and was the last one left) in an XL. But after closely looking it over I was turned off by the material, the sheer mesh panel in the back was a very cheap polyester. I’ve found nicer and similar in style items at Forever21 and H&M. Another on my list which I did not find was the Lace Overlay Top -White/Black again zero in store and online. As you are seeing the trend I am having no luck. The few items left in the store that I did get to try on which I actually did like was the Drop Waist Dress in First Date Print and the Lace-Up Pump as I posted my picture to @instagram from the fitting room. 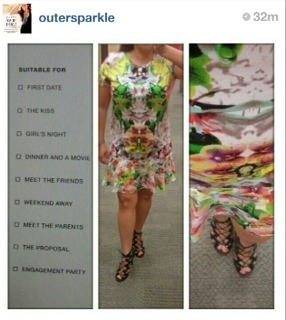 I also tried on the Dress in Meet the Parents Print which I liked as well but neither dresses where “Must Haves” for me! So no luck in the shoes or handbag department either, so my shopping trip for Prabal Gurung found No “Love” from me! Target has to find a way to have the assortment of items for these designer Launches available in store for us to actually be able to shop,and not have some items online only and some in store only. And also I believe also set a limit to the number of same items the customer can buy,cause as soon as the doors open one person grabs a whole rack! But anyways I hope your shopping trip was more successful than mine was.